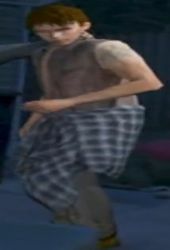 Larry Tupper is a character in the HD Universe who appears as a minor character in Grand Theft Auto V.
Larry Tupper was born in 1986 and at some point prior to 2013 began purchasing methamphetamine from Trevor Philips but later began buying from another dealer and then becoming a dealer himself. Tupper is later arrested for cooking 'up a batch' of methamphetamine, which was discovered when the trailer being used caught fire, and is bailed by Maude Eccles before failing to return for trial. He begins hiding at a small barn with some friends with Maude warning Trevor, now employed by Maude to capture him, that he has a history of violence. Trevor, when confronting him, can either kill Larry or apprehend him and return him to Maude. On their way to Maude's trailer, Larry states he is surprised that Trevor has time to capture bail jumpers after hearing of the deaths of Johnny Klebitz and Ortega as well as the problems with The Lost Brotherhood and the Los Varrios Aztecas. This page was last modified on 6 April 2014, at 15:56.